Alexander performed February 11th, 2018 on Show 349 in Boston, Massachusetts. 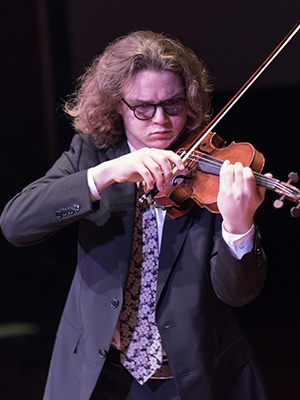 Alexander Franco Goldberg (violin), 17, hails from Redwood City, California and now attends Andover High School in Andover, Massachusetts. Alex has soloed with the San Francisco Chamber Orchestra, earned top prizes from the Pacific Musical Society, Menuhin-Dowling Competitions, American Protégé International Concerto competition, Palo Alto Chamber Orchestra (PACO) Concerto Competition, and Brockton Symphony Orchestra’s Dr. Carol Vasconcellos Youth Concerto Competition. Alex’s favorite musical experience has been spending the summer studying at the Accademia Musicale Chigiana di Siena (Italy), which he attended as a Merit Diploma student. He studies violin with Donald Weilerstein at New England Conservatory Preparatory School. In his spare time, he enjoys reading, collecting vinyl LPs, watching classic films, hiking, and doing crossword puzzles.